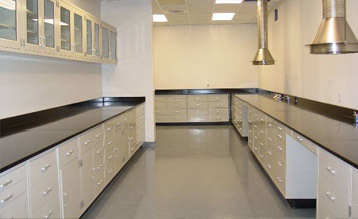 Click to enlarge the laboratory application photos below. 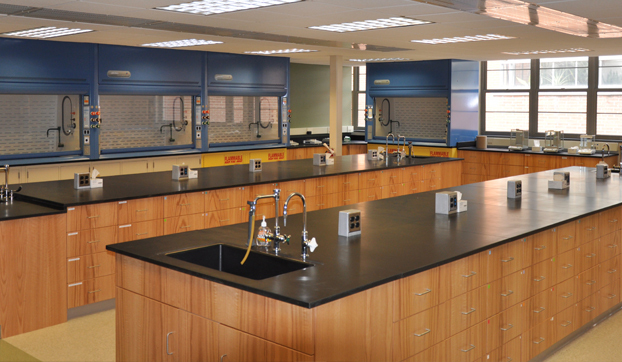 For the laboratory, we offer a complete product line allowing you to envision and create the lab environment that is best suited for your unique application. 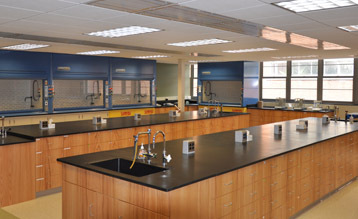 Metal, stainless steel, wood, and plastic laminate caseworks are offered so that you have the opportunity to match the product with your individual needs - clinical, government, research, or educational. This line represents our 15 most popular models in our most popular color, champagne. 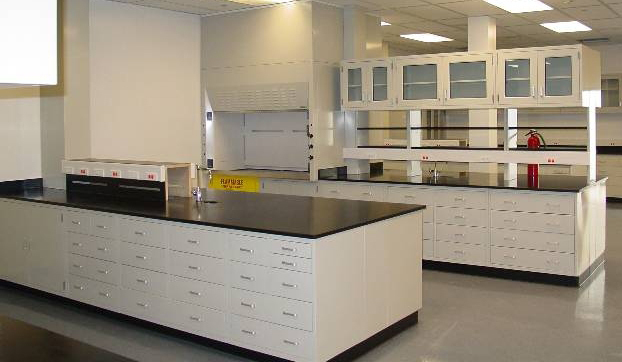 The program also offers countertop solutions, service fixtures, and related items, such as reagent assemblies and fillers, to complement your layout. 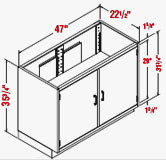 AVAILABILITY IS 10 DAYS after receipt of your approved drawing and or signed purchase order. 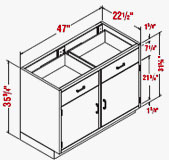 Unit includes one 71/4" high drawer above cupboard door with one adjustable shelf. 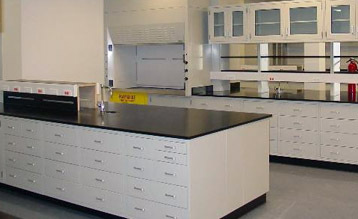 Unit includes two cupboard doors with one full width shelf. 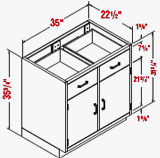 Unit includes two 71/4" high drawers above two cupboard doors. One full width shelf is included. 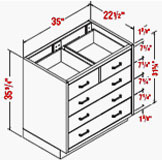 Unit includes four 71/4 " high drawers opposite one full height cupboard door and one adjustable shelf. Specify left or right hand cupboard door location. 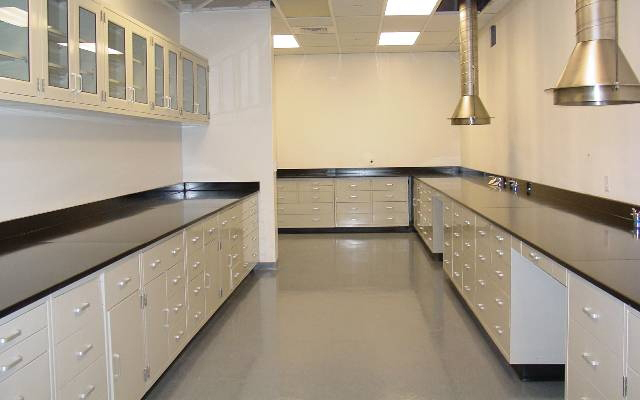 Unit includes two 71/4" high drawers above three 71/4" high full width drawers. We have a complete product line of over 250 base unit, wall unit and freestanding unit models. Only the finest U.S.A. cold rolled, prime gauge, mild furniture stock steel is used. The all welded, heavy gauge uni-body is manufactured in 16 and 18 gauge steel. 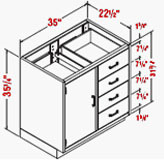 The drawer slide, self-closing in design, is warranted for the life of the unit. The slide features removable roller bearings for sterilization purposes and continued ease of operation. Drawer and door pulls are cast in aluminum and are 100% corrosive resistant. A full submersion, 3 tank wash system cleans each unit individually to ensure the proper surface for paint finish application. The corrosive resistant, epoxy based dry powder paint is electro-statically applied, then oven cured for 15 minutes at 400° to ensure the best finish possible. 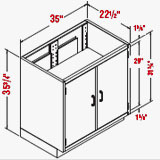 Cupboard interiors, pilasters and shelving feature 1” centers to easily accommodate your shelf height requirements. Models with glass doors feature 1/4" thick glass, encased in a double panel and reinforced by a steel frame with recessed rubber channeling. Customer controlled keylocks on any drawer or door may be added as necessary in the field. Copyright © 2010 Southern Medical Systems, Inc.